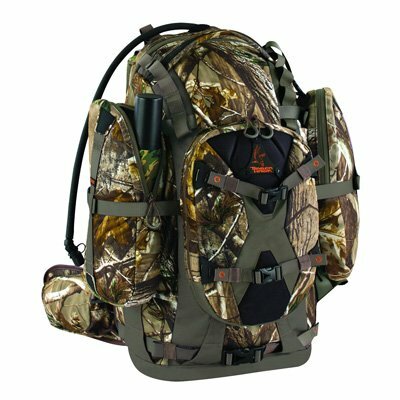 The Timber Hawk Killshot Backpack is one of the most popular hunting backpacks on the market. It comes with features such as a roomy main compartment, Raptor compression straps that stabilize load, a stowaway blaze orange rain cover, two-litter reversible hydration bladder with an insulated hose, a deluxe padded waist belt, an excellent weapon bow and rifle storage system, multiple lashing points for additional storage and a well-padded front organizer, among several other extremely useful features. 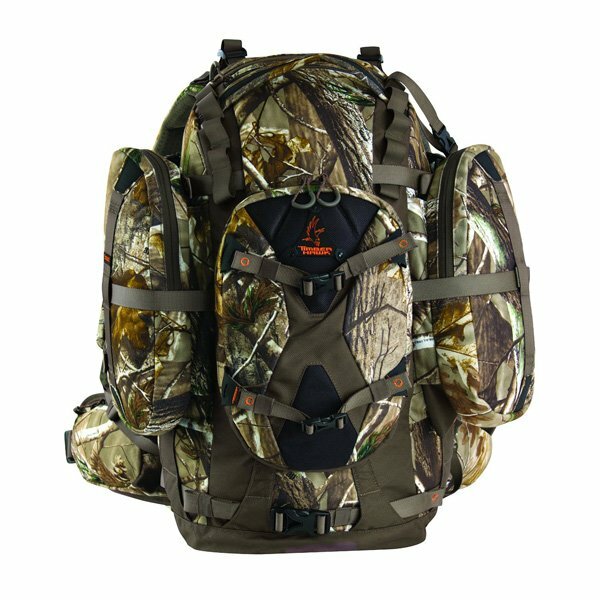 In this Timber Hawk Killshot Backpack review, we will focus on some of the major features of the Timber Hawk Killshot, its pros and cons as well as sample customer FAQs. 1.9.1 Q. Who are the manufacturers of the Timber Hawk Killshot? 1.9.2 Q. Does the pack come with a warranty? 1.9.3 Q. What is the pack’s capacity? 1.9.4 Q. What colors can I purchase the Timber Hawk Killshot pack in? 1.9.5 Q. What is the weight of the pack? 1.9.6 Q. What are the dimensions of the pack? 1.9.7 Q. Does the pack have the ability to carry a bow or a rifle? 1.9.8 Q. Can it carry a tripod? 1.9.9 Q. What fabric is the pack made of? 1.9.10 Q. Does the Timber Hawk Killshot come with an internal frame? 1.9.11 Q. Is the Timber Hawk Killshot waterproof? 1.9.12 Q. Does it come with a rain cover? 1.9.13 Q. Is the pack hydration compatible? 1.9.14 Q. Is the Timber Hawk Killshot a good overnight backpack? 1.9.15 Q. Can the pack haul meat? The Timber Hawk Killshot comes with an excellent stowaway blaze orange rain cover that has its own designated compartment or pocket where it can be conveniently stored when not in use. The rain cover is designed in such a way that it has the ability to cover the entire pack to keep your gear dry when the weather turns unfriendly. And when the weather is friendly, you can easily pack away the rain cover in its own designated pocket so that it doesn’t get in the way of your hunting gear. The pack comes with a very quiet twill fabric lining that gives it its impressive quietness. As a result of how quiet the pack is, one can easily carry it through the woods and go unnoticed by game. In addition to the twill fabric’s quietness, it is also durable and contributes a lot to the pack’s rugged and durable nature. Another feature of the Timber Hawk Killshot worth pointing out is its brilliantly adjustable shoulder strap system that can be easily adjusted to fit a wearer regardless of his or her torso size. In addition to this, the shoulder straps provide the wearer with stability and comfort. The pack comes with a very spacious main compartment, right and left accessory pockets on the hip belt designed to hold your accessories, a well-padded front organizer compartment that keeps your gear perfectly organized, an internal spotting scope sleeve (pocket) and a shoulder strap pouch that can be used to securely hold a number of things, especially your digital devices such as your phones, radios, GPS, etc. The pack also comes with a drop-down scabbard that securely stores your rifle and multiple lashing points for external storage. Also, the multiple straps the pack comes with can be used in multiple ways to securely carry your bow or rifle. The excellent raptor compression straps that the Timber Hawk comes with is another one of its major prominent features. The compression straps are very important in the sense that they shrink the pack when it is not fully loaded in order to allow for load stability. This makes carrying the pack very comfortable. It is a quiet pack that helps you to go unnoticed in the woods. 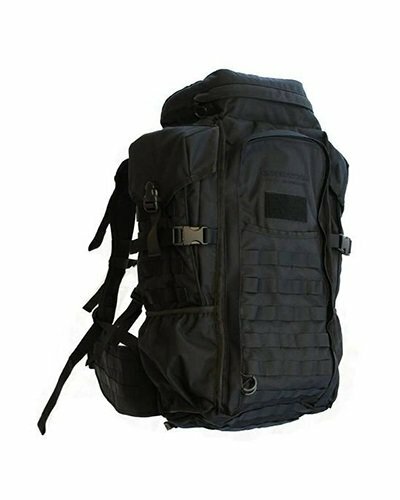 It is a rugged and very durable pack. It is very spacious and can contain enough gear for overnight hunting or hiking trips. It is hydration compatible and comes with a two-liter hydration bladder. The pack’s internal frame provides a great deal of stability. It comes with an excellent stowaway rain fly (cover) that protects your gear from rain. It comes with lashing points that allow for an excellent exterior storage. 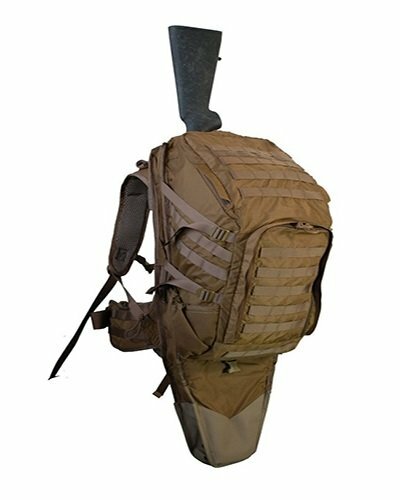 The pack can securely and comfortably carry a bow or rifle in multiple ways. The pack comes with Silent Stalk quick-ejection clips which allow the wearer to quickly and easily drop the pack. It comes with an adequately padded front organizer compartment which allows you to keep your gear and accessories well-organized. It comes at a reasonable price considering all the excellent attributes it comes with. It comes with an unconditional lifetime warranty. The pocket of the spotting scope is not big enough to perfectly accommodate certain scopes. It can be a little bit heavy – especially when fully loaded. Q. Who are the manufacturers of the Timber Hawk Killshot? A. The pack is manufactured by Timber Hawk, which is an American company founded in 2005. A. Yes it does. The manufacturers of the pack offer customers an unconditional lifetime warranty. Q. What is the pack’s capacity? A. The total capacity of the Timber Hawk Killshot is 3,324 cubic inches. Q. What colors can I purchase the Timber Hawk Killshot pack in? A. You can get the pack in two colors, namely Realtree Xtra® (RAX) and Mossy Oak Breakup Country (MBUC). Q. What is the weight of the pack? Q. What are the dimensions of the pack? A. 12.5w x 12d x 22h inches. Q. Does the pack have the ability to carry a bow or a rifle? A. Yes. You can use the Timber Hawk Killshot to comfortably and securely carry a rifle or a bow. Q. Can it carry a tripod? A. Yes it can carry a tripod. Q. What fabric is the pack made of? A. It is made of polyester fabric. Q. Does the Timber Hawk Killshot come with an internal frame? Q. Is the Timber Hawk Killshot waterproof? Q. Does it come with a rain cover? A. Yes it does. The Timber Hawk comes with an excellent stowaway blaze orange rain cover. A. Yes. The Timber Hawk Killshot has a 2-liter reversible hydration bladder with an insulated hose. Q. Is the Timber Hawk Killshot a good overnight backpack? A. With 3,324 cubic inches of storage space, the Timber Hawk Killshot has room big enough to contain a couple of nights’ worth of gear. Q. Can the pack haul meat? A. Yes! The Timber Hawk Killshot comes with a main compartment that is large enough for hauling as much meat as you can carry. The Timber Hawk Killshot review above shows a whole lot of excellent features and specifications that can be quite rare to find in similar backpacks on the market. 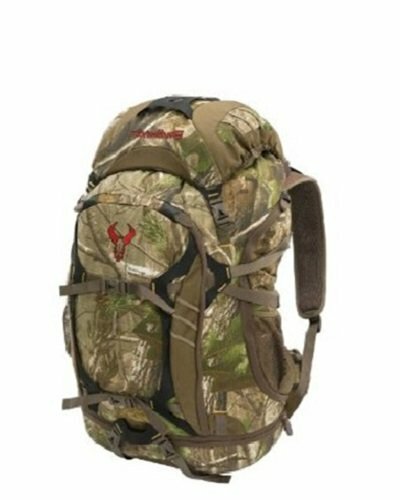 If you are therefore looking for a very capable hunting backpack that offers a variety of options, then the Timber Hawk Killshot is definitely worth considering.